The Memorial Service for Dad was today. What a lovely celebration of his life. Thank you all who came to honor the life of my most wonderful father. And thank you for dressing, as we requested, in bright colors to celebrate life eternal. The Sunnyside staff even met people with a box of Hawaiian leis for people to wear. Dad would have loved it! Thank you all so much for coming here today to honor the life of my father, Howard Davidsmeyer. Dad had a wondrous gift for life, and he lived it abundantly. To me, the two words that best characterize his life are: joy and compassion. Dad was blessed with a quick wit, a sharp mind, and an unbounding sense of humor. And though I dearly loved him, I have to admit, he could be trouble. Even at the end. Do you know the terrible time we had just trying to find a picture for Dad’s obituary? You try to find a picture of Dad where he wasn’t wearing a funny hat, or carrying a fish purse, or wearing a lobster bib, or clutching some slightly naughty dancing and singing mechanical toy to his breast. This was a man who couldn’t open a present without taking the ribbon from the package and attaching it to the forehead. We have precious few Christmas pictures of Dad without his head being covered with bows. And I love every one of those photos. JOY was the wonderful gift he gave to our family. We’re a family that laughs together. We even laughed at the funeral home. I’m sure many here have gone through the experience of the Funeral Director trying to UPSELL you, buy extra stuff. In the office, we were surrounded by product displays. When the funeral director asked if we were interested in mini-urns, so all his loved ones can have a bit of his ashes, I started giggling, especially when my brother asked if the mini-urns were what looked like the salt and pepper shakers. We tried not to laugh as she continued listing the products, but when she got to the “eternity lamp”, we lost it. The thought of Dad — who was so non-mechanically inclined that he had trouble changing a lightbulb — the thought of his ashes being interred in a desklamp and spending eternity as an appliance was ludicrous. And then my brother suggested attaching it to a clapper. Hey Dad …. Clap-clap. What can I say – Dad raised a family that just can’t help but laugh. Dad’s humor could manifest in unusual ways. For instance, when he was Chairman of the Building Committee in New York. The existing church was an early-century home, which would now be connected to the new church building by a long corridor. The renovation utilized classic, conservative earth tones, yet Dad decided to paint the wall on the end of the connecting corridor a bright fluorescent neon red. Oh, my, when the church opened, you should have heard the complaints. All anyone could talk about was that dreadful red wall. Oh, the building was wonderful except for that wall. And no one noticed any other problems, or any imperfections. Dad gave them something to focus all their negativity on, and, when he demurred just before the dedication ceremony, to paint the red wall to match the other colors, then everyone was united in enjoying the beauty of their new, perfect church. He often applied his “red wall theory” to other businesses and endeavors in his life. Dad was a man of many accomplishments: he was a highly respected businessman, a church leader, a phenomenal athlete, a philanthropist — but above all, he was a devoted family man. He was an awesome dad to me and my brother and sister. And he was my mother’s best and dearest friend. Perhaps you heard him tell the story of how he met his future bride in the second grade. He said he came home from school that night and declared at the dinner table that he had just met the girl he was going to marry. Well, Mom says that they didn’t actually meet until 8th grade, but the story sounded so good and Dad so loved to tell it, that she never corrected him. The BUCS were not the end of their marriage, and they enjoyed a blessed 68 years together. Wow… Dad and mom were together 68 years. If you want to know what love truly looks like, then look no farther than Jean and Howard Davidsmeyer. So many people spend their lives looking for their soul mates: my parents were blessed in that they found their perfect match so young: regardless whether it was in the second or the eighth grade. And Dad did like to flirt. He liked to gossip. He liked to do all things that made people smile. Because, most of all, Dad was a kind man. He had compassion for everyone. In his business office at ComDev, he had a sign, a quote from Benjamin Franklin, “When you are good to others, you are best to yourself.” That was the motto of his life, and he applied it in the business world and where ever he went. He told me once that the truest thing in life that we all had to learn was to simply be kind. The most wonderful thing about kindness is that you can never give too much and you can never be too nice. In all things, big and small, always remember to be kind. That was my Dad, ever ready to help someone, give a thoughtful compliment, offer a heart-warming smile. At last week’s church service, I was reminded of my father in the reading of the story of the Good Samaritan. At the end, the question is asked, which of these truly acted as a neighbor. The answer: the one who showed compassion. That was my Dad, the one who showed compassion. He truly lived his faith, knowing that wherever you go, whoever is around you, that is your neighbor, and he treated all with neighborly compassion and kindness. At the end, in the hospital, one of the last things that Mom said to Dad as she kissed him farewell was, “We sure had a fun time, didn’t we?” Looking out into this room filled with so many of Dad’s friends and neighbors, wearing such happy colors, with even a funny hat or two, I know that you shared that same experience of joy with him and were the grateful recipients of his loving kindness. As we remember Dad, it’s sad to know that we will never again be blessed with the sight of him wearing one of his goofy hats, or laughing giddily over one of his mechanical toys. None of you need a mini-urn to keep his memory alive. His JOY and COMPASSION live on in all his neighbors, friends, and family. Let us all remember that the world was filled with so much more laughter and joy because of a man named Howard Davidsmeyer. So, I would like you all to say farewell to Dad, just as my Mom did. On three, I want you all to say, “Howard, we sure had a fun time, didn’t we?” One, two, three… HOWARD, WE SURE HAD A FUN TIME, DIDN’T WE? 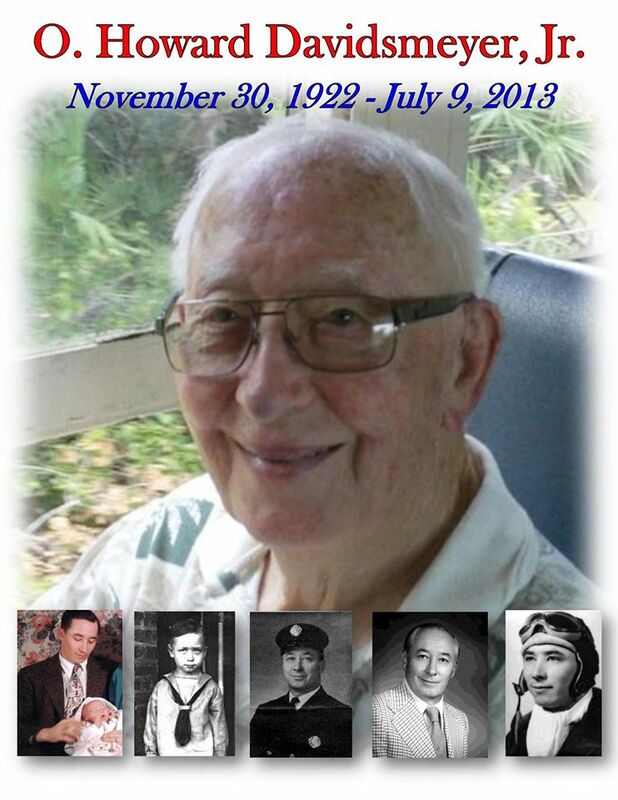 Orville Howard Davidsmeyer, Jr., 90, of Sarasota, FL, died on July 9, 2013. Services will be held at 10:30 am on Fri., at Sunnyside Village Chapel, 5201 Bahia Vista in Sarasota, FL. A highly respected Florida businessman, church leader, athlete, and philanthropist, Howard Davidsmeyer was above all, a devoted husband and father. Born in Shawnee, Oklahoma, Howard attended the University of Iowa, playing on their football team under Dr. Eddie Anderson. He left college to fight in WWII. While training to be a pilot, he played football for University of Georgia, among others. As an Ensign in the US Naval Air Corp, he flew Hellcats and Corsairs off carriers in the Pacific. In a 1944 wartime wedding, he married his childhood sweetheart, Dorothy Jean Yost. After WWII, Howard served as a plant manager for AT&T. He later developed several businesses in New York, Virginia, and Florida in the telephone, hardware and marine industries. He was cofounder of ComDev, Inc. which was bought by General Dynamics. Later, he was a telecommunications consultant and served on several Boards of Directors of emerging companies, most recently Phantasmic Home Entertainment. Always active in church, he served the Church of the Cross and Pine Shores Presbyterian Church in Sarasota. In New York, he headed the building committee for the Massapequa Reformed Church building dedicated in 1969 by Dr. Norman Vincent Peale. Howard volunteered on local foundation boards, including Players of Sarasota, as treasurer of the Pines of Sarasota, Chairman of the Board for University Club, and most recently President of Sunnyside Resident Association. He is survived by his wife of 68 years, Dorothy Jean Davidsmeyer, his son O. H. Davidsmeyer III of San Antonio, Texas and daughter Jo Ann Davidsmeyer of Sarasota, Florida. He was also the father of the late Dona Davidsmeyer Beale. He is also survived by a sister Margaret Sprenger of East Islip, New York and in-laws Darlene and Norman Yost of Sarasota. He has three grandchildren and five great grandchildren. He loved entertaining and sharing laughter with friends and those soon to be friends. Please, no flowers. Those attending the memorial, please wear happy colors in celebration of life eternal. Knee surgery went well. I was released from hospital today and am currently in rehab. Don’t know how long I’ll be here. Thank you all for your prayers and support! Surgery tomorrow to have my knee replaced. I just want to thank everyone who has been so supportive through these last few months. Been very stressful. As some of you know, in March, I had a triple whammy on one day: I found out in the morning that my position had been eliminated by the school district, in late afternoon i was struck by a car on I-75 and taken away by ambulance (car was totalled), and at the hospital when they took a scan of my neck, they discovered I had major growths on my thyroid. Thank God the growths turned out benign. Since then I’ve been struggling with pain from the knee, worry over my parents and the care for Dad, the slow demise of my cat, and well ….. the list goes on and on. It’s been very rough. I’m actually looking forward to the surgery so I can spend a restful month with no responsibilities and maybe no worries for a change. I have, alas, used my struggles as an excuse to let up on my diet. I have not been logging my food daily, which is the single best way to lose weight. And, because of the daily pain from my knee, I have dropped my exercise to just once a week. Consequently, I have gained back ten of the pounds that I have lost. Cross finger …. I have been told that the stress of surgery makes most people lose 10 pounds during their hospital stay. I’m hoping! Thank you all for your patience and support. Prayers tomorrow at 8:00 for surgery will be greatly appreciated. 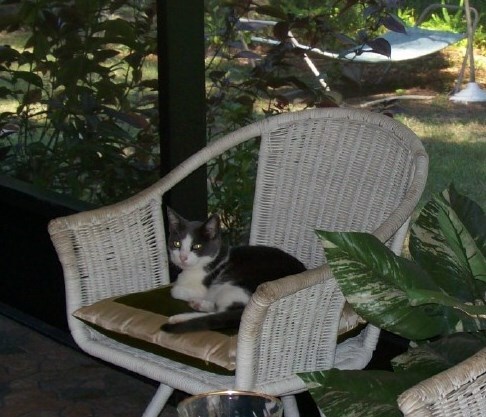 Today I said good-bye to my beloved Miss Kitty. She came to me as an adult cat and I’ve been blessed to have her in my life for nine years. Rest in peace, my sweet kitty. Best laid plans of mice and men, and apparently dieters, go often awry. 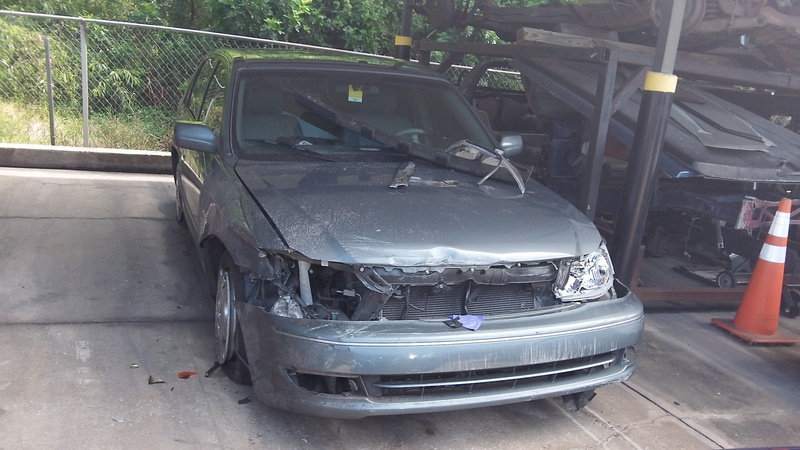 A week has passed now since my accident. The insurance company has designated my car a total wreck. And I’m feeling like my doctor should designate me as one, too. Ow, ow, ow! I’m glad the x-rays show no broken bones, but, boy! I hurt all over. Tried to go to the gym today but couldn’t do a thing. And now I’m walking with a cane. You know, gym and cane and black-and-blue pain really don’t mix. I’m still staying on the diet, but, missing the gym very, very much. This is going to throw my plans off. Definitely going to have to re-adjust my goals. Looking at a used car tomorrow. I’m hoping to have another car soon, so I can return the rental. Alas, I had trimmed back on my insurance costs recently and removed the rental car option from my insurance. Well, that was short-sighted, wasn’t it! I’m paying out of pocket for my rental. Definitely a strong incentive to find some used care very quickly. I’ve got an appointment in a month with a thyroid specialist to check on the growths. A month! Nerves on edge already. How can I wait a month to find out what’s happening inside my body? I’ve asked to be called if there’s any cancellations in the meantime. I hope so. This tension is going to get to me. Prayers are welcome! Oh! Look at my poor, poor Avalon! Thank you, God, the car didn’t make it out alive, but i did. I’m sore, but I’m all in one piece. Praise God! Yesterday was pretty rough. I hope three times is the charm, because I had my three all in one day and I want no more. 1) Came in to work and was told by my principal that Sarasota County has decided to eliminate all media specialists (or, as we used to be called, “librarians”). So, my dream job that I have loved for the past three years is gone. I will have a position next year at the same school. But, my beloved library will be run by an aide. 2) Driving home from work on I-75, I was broadsided by a panel truck going way over the speed limit. I didn’t actually see the accident. I was traveling in the middle lane and I just felt this huge impact on the passenger side in my blind spot. I was forced off the road, through the barrier, spun around and the car was, for a time, on its side. Thank the Lord that it fell back right-side up and I didn’t flip. The truck wound up passing me, hitting another car and then spinning into the median and flipped. I was taken away by ambulance. Hurt all over, sore all over, but no broken bones. Car looks like it is totalled. 3) While in the emergency room, they ran all sorts of tests. During one of the scans they discovered several growths on my thyroid, that now have to be looked into. Well, at least I didn’t resort to a hot-fudge sundae for comfort. Of course, this is not due to willpower, but more due to the fact that I didn’t have a car to drive to an ice cream shop. Those Christmas treats – stretching them out. I had some wonderful treats as gifts from my students. Very sweet of them. Of course, they have no idea that I’m living a new lifestyle. While I will re-gift some things — I’d NEVER re-gift something that a student gave me. Their thoughts and consideration are just too precious to me. One little girl gave me home-made fudge. Of my gosh, so delicious! Thankfully, it was in a small tin. I thoroughly enjoyed it — one piece per day. What a fantastic recipe! This was truly incredible fudge — white and dark. The tin of popcorn wasn’t home-made, but it was delicious. To avoid temptation, immediately upon opening it, I got out the Ziplock bags and started creating one-serving size portions. Easier to track calories when you’ve made 120 calorie bags. And it still tastes just as good in small portions. I still haven’t touched the tin full of Dove chocolates. Those will keep until I get to them. I really did appreciate the home-made pickles from another student. My goodness, who makes pickles anymore. Obviously this family. And, boy, were they delicious. And so easy to fit within my daily goals. What a wonderful Christmas. Blessings to all of you. Had a great day with family. Enjoyed the dinner without over-indulging. Best of all, I enjoyed the warmth and joy of loved ones. I started my journey in July with a goal to lose 40 pounds by Christmas. The last two weeks were a scale setback, but I was patient.I had a friend kept telling me that my weight gain of the last two weeks was just water weight – that I had stressed my muscles so much that they were holding on to the water – to just be patient and keep on the plan. Well, he was right. I had the “whoosh” before Christmas, where my body suddenly decided to let that water go. When I got on the scale this morning, I was SIX pounds lighter. And that means I reached the goal I had set for myself in July. What a great Christmas present! Now, another 40 pounds by summer??? Yes! I can do it. Right now I’m dashing madly around the house desperately trying to get all the presents wrapped. Later tonight I’ll make chocolate covered Strawberries for my Aunt and Mom. I’m foregoing making my traditional fudge for the family. I just don’t think I can resist that temptation. Then it will be off the church for the candlelight Christmas eve services. I’ll be singing a solo at the services. Karla found an absolutely beautiful Christmas ballad called “The Hallowed Manger Ground” for me to sing. What an absolutely haunting melody. I love it. Supposedly it’s a popular song, but I have yet to hear it on the radio. If you haven’t heard it, go to YouTube. It’s truly lovely. May the blessings of Christmas be to you and to your families.